The 2017-2018 season was yet another very successful one for Heli and Cat Skiing operators in British Columbia. Ample snow and cold temperatures made for consistently excellent skiing conditions. Skier days in the sector grew 2.7% to over 124,000, with many members operating at or near full capacity. In spite of this success our sector was rocked by the tragic loss of long time ski guide Lisa Korthals in an avalanche. The outpouring of grief and support in the aftermath of her accident showed how close our community is; it really hit home. Our hearts go out to Lisa’s family and her many, many friends. Safety remains the biggest challenge and the top priority for all of us; ensuring that everyone returns home, healthy and happy. Finding ways to enhance safety in our sector will always be a key strategic focus for HeliCat Canada. This past year was one of change. After five years as our Executive Director Ian Tomm stepped down from that position. During his tenure he built the team, structure and processes that have elevated us to such a professional level. He helped establish HeliCat as a highly credible voice for our sector and as a leader amongst adventure tourism organizations. He tackled numerous challenging and complex issues and built key relationships that will help pave the way forward for us. Ian, on behalf of the Board of Directors and all the members of HeliCat Canada, thank you! After an extensive selection process we were very excited to welcome Ross Cloutier as the new Executive Director of HCC. Ross brings close to 40 years of adventure industry experience to the role. He has worked in over 30 countries developing adventure tourism businesses and strategy, and with First Nations communities in Canada’s north, British Columbia, Labrador and Patagonia. Ross was the founder of the Adventure Studies Department at Thompson Rivers University and was the President and Board Chair of the Canadian Avalanche Centre (Avalanche Canada). I feel very fortunate to have Ross join our association. Under his leadership I’m confident that we will take HeliCat to a new level as we strive to support you and to represent our sector through the many challenging issues we face. One of those challenging issues rose to the forefront shortly after Ross assumed his new role. Ensuring that our operations don’t negatively impact the mountain caribou we coexist with has been a priority for our sector for decades. However with this spring’s declaration of an imminent threat to seven local population units that overlap several members’ tenures, and an emergency order to follow, addressing this issue became an urgent focus for the association. We view this situation and its potential implications for the future Heli and Cat Skiing in British Columbia as one of the most serious we have ever faced. Ross and Dave Butler have spent many days in Ottawa and Victoria and have done an amazing job ensuring that key decision makers know of our commitment and long-standing success operating sustainably in mountain caribou habitat. This is a continuing and evolving issue that we will keep you updated on. I would like to thank the Board of Directors and committee members who work diligently on behalf of the association and our sector. But I must reserve a very special thank you for Ross, Andrea and Miranda who do the real heavy lifting. We’re very fortunate to have you on the HeliCat Canada team! This year marks our 40th anniversary as an association representing the Helicopter and Cat Skiing sector in Canada. We’ll be celebrating this milestone at our annual general meeting in Victoria and we look forward to seeing you there! Jumping into an organization with as many moving parts as HeliCat Canada has been daunting to say the least. But it has also been stimulating. As a relative neophyte to the organization it will continue to take a while for me to engage fully with all of HeliCat’s strategic Safety, Tenure Integrity, Sustainability and Member Service actions but I am gradually beginning to understand the scope and scale of what the association does for the helicat industry. And it is a lot. The association enables members to focus on business operations while HeliCat represents their interests to the broader community of stakeholders. And has done this well and with significant impact. Association staff engage in a wide variety of government and public relations, research, special projects, conferences and workshop organization, accreditation and member service activities – all of which are intended to support the membership. During the 2017-18 year HeliCat expanded its research and special projects program with a total of eight projects receiving $128,212 in funding. This is an expansion of over 4.5% from the previous year. In the 2017-18 year we continued to help fund avalanche research at Simon Fraser University, finished a new helicat incident reporting database which is now ready to launch, compiled an industry wage and benefits survey, contributed to the funding of a wolverine study conducted by the University of Calgary, contributed to the organization and administration of the new BC Adventure Tourism Coalition, completed a Sustainability Next Practices strategy that will help move us into the next generation of industry sustainability practices, and led ground-breaking work in determining the socioeconomic impacts of mapped caribou habitat on the helicat sector and the actual business impacts of a potential Government of Canada Emergency Order under the Species at Risk Act. Along with the Province of British Columbia, we have also funded an analysis of the past 10 years of caribou interaction data submitted by HeliCat members. It would be the understatement of the year to say that how the Governments of Canada and British Columbia decide to move forward on the management of mountain caribou have taken over the last few months of HeliCat government relations actions. An imminent Government of Canada Emergency Order pertaining to the management of mountain caribou in British Columbia, current negotiations between Canada and British Columbia to develop a Mountain Caribou Conservation Agreement (both of the previous under the federal Species at Risk Act), British Columbia’s efforts to develop a new Caribou Recovery Plan and a new provincial Species at Risk Act, and ongoing negotiations between HeliCat and British Columbia pertaining to an updated MOU have completely taken over our government relations focus. All of these have potential to significantly change the landscape of helicopter and snowcat skiing in BC. To assist us in this work we have retained Global Public Affairs to help us communicate our message in both Ottawa and Victoria. What is decided over the next few months by BC and Canada with regard to how caribou will be managed in BC going forward, and the implications of this on the HeliCat industry, is the single biggest issue the industry has faced. Because of the wide-ranging implications of these decision on helicat operators we are taking this very seriously and are working hard to communicate the implications of these decisions on our sector. We are also trying to learn what we can moving forward expecting that similar discussions will occur in the near future with regard to other wildlife species such as mountain goats and wolverines. Anytime a new executive steps into an organization their success is directly related to those who held the position previously, longstanding staff, and board. Thanks are due to Ian Tomm who has helped tremendously by being so organized prior to my arrival and with his ongoing advice, Andrea Lustenberger who possesses amazing administrative intuition and work ethic, Miranda Murphy for all her leadership on HeliCat finances and special projects, and the Board of Rob Rohn, Chris McNamara, Doug Feely, John Fournier, Jeff Honig, Mike Sadan, Geoff Straight, Graham Holt and Paul Osak. As they say, any oversights, missteps, and bloopers going forward are clearly my own. How does our sector add up? Financial health is a key component of sustainability. Socio-Economic hours include Caribou Socio-Economic report and HeliCat 2019 Socio-Economic spending. *hours do not include accreditation inspectors, external research or special project contractors. Growth and development, by design. Now in our second year of implementing a revamped accreditation program, we're very pleased with the level of progress and engagement we've seen across the sector. Over the past twelve months, a medical task force was developed to examine current standards and to make recommendations to the Accreditation Committee regarding potential changes, and the committee has continued to review and update policies and procedures based on such valuable feedback. As our industry grows and evolves, so do our goals and expectations with respect to safety. Continual improvement in all aspects of safety is what guides our research and development. Relationships with government, regulators, the public and various stakeholders enhance and increase our association's efforts to promote the sharing of experiences and expertise in order to inform best practices across the board. Key highlights include the federal approval for Dr. Pascal Haegle's NSERC Research Chair in Avalanche Risk Management, of which HeliCat is a key source of financial funding from within the industry. Sharing and learning from one another only strengthens a community. HeliCat continues to develop its incident management program, including an ongoing and innovative project in collaboration with SFU and MiTacs to build a database of historical incidents in an effort to better understand risk within the sector. This past winter, 5 incident reports were filed with the Association, and 3 case studies were presented at our spring meetings. Work continues with Gougeon Insurance to develop and enhance incident management resources for our members. Industry is always looking maximizw OH&S. Members Selkirk Tangiers Heliskiing are the first heliskiing company to be COR certified, having passed their audit in 2017. HeliCat's OH&S Program Template continues to see adoption throughout the sector, and we are in frequent communication with WorkSafeBC to discuss topics of particular interest, such as potential rate increases, funding opportunities, regulatory amendments and research initiatives. Our fall AGM & spring meeting were attended by a sweeping variety of members and non-members, from ski guides and operators to policy makers and non-government stakeholders. As always, we were encouraged and inspired by the common desire to support the positive and sustainable growth of our industry. HeliCat continues to work with sponsors to promote the HeliCat industry. We would like to thank all our sponsors from the past year, especially our primary sponsors listed below. Through the continuous development of our primary and special event sponsorship categories, and benefits, we continue to strive for growth within our sponsorship programs. We're committed to staying in touch and spreading the word, one click at a time. In 2018, we redefined our priorities with respect to our communications plan. The goal was still to align key communications objectives with our 2020 strategic plan, but we restricted our focus to a few key strategies. The result was a streamlined and consistent social media platform, increased engagement across our primary channels, and our highest AGM attendance to date. 46 published newsletters, updates and reports. 243 additional stakeholders on additional mailing lists. Distribution to owners, staff, investors and decision makers around the world. Our organization is built upon a framework of collaboration, education, and a commitment to continual growth. 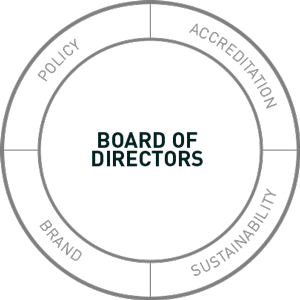 The board and four keystone committees continue to respond to the changing face of our industry with updated and improved oversight, terms of reference, work plans, and ever-evolving policies and procedures to guide their work. Together, this volunteer team works with staff to fulfill the mandate of HeliCat Canada, optimizing the use of human and financial resources to maximize value to industry. Continued oversight and guidance on key policy issues impacting the sector. Continued promotion of the HeliCat Canada brand within the sector and around the world. Reformatted standards and procedures to simplify and clarify the accreditation process. Environmental stewardship and advocacy with respect to Mountain Caribou MOU.